This is one of my latest Oh So Baby cakes taking inspiration from the gorgerous lion I picked up. The cake features Huggies Nappies, Lion Toy, Fleece Blanket, Burp Cloth, Bib and Socks and is a bit of a change from the pastel baby colours. I've used foam to make petals to form the flowers - this is a new idea and I hope that it goes down well. 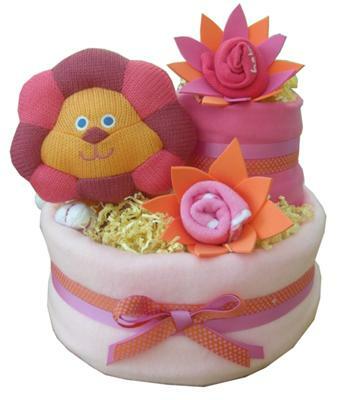 Leona the Lion Baby cake is just awesome and i like your innovative ideas to make this. Thanks for posting!